Informal group portrait. 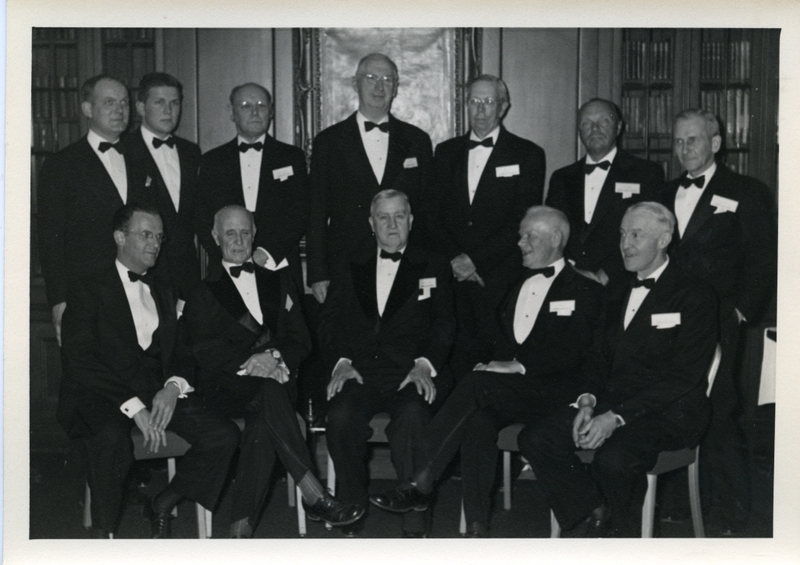 Back (left to right): Roundy, Richard A. Jr. (Bowdoin 1947, Treasurer Bowdoin Club of Boston); Gibson, Robert B. (Bowdoin 1952, Pres. Bowdoin Student Council); Van Cleve, Thomas C. (Bowdoin fac. ); Burns, Kendrick (Bowdoin 1914, Pres. Bowdoin Alumni Council); Evans, Henry D. (Bowdoin 1901); Martens, Eugene B. (Pres. Bowdoin Fathers Assoc. ); MacDonald, Joseph B. (Bowdoin 1915). Front (left to right): Fowler, Theodore L. (Bowdoin 1924, Retiring Pres. Bowdoin Club); MacMillan, Donald B. (Bowdoin 1898); Sills, Kenneth C. M.; Nixon, Paul (Master of Ceremonies); Humphrey, Edward (Bowdoin 1917, Pres. Elect Bowdoin Club).